Airth Castle near Kincardine Bridge in Central Scotland has to be one of Scotland’s best wedding venues. Originally built in the 14th century this Castle is steeped in Scottish History and even has its own ghost! The green phantom as it’s called roams the Castle from time to time and has a habit of putting his hand on your shoulder. I’ve personally experienced this in the main castle itself a few years ago. As a wedding venue Airth Castle has a separate function suite which is very beautiful and a good size as you’ll see from these pictures. My 4ft tall Mr & Mrs giant letters at Airth Castle. 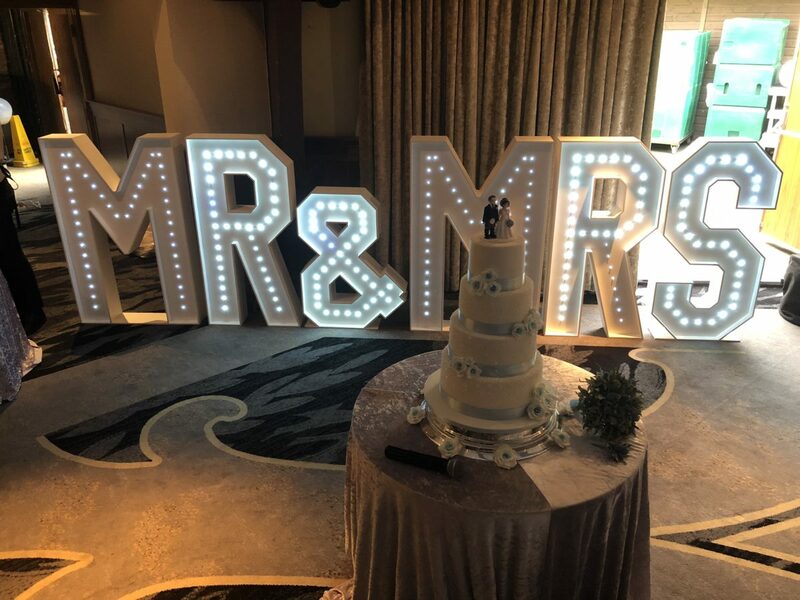 Giant letter hire is very popular and my Mr & Mrs letters looked great in the lovely big function room. 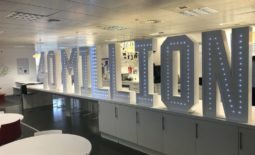 We do “LOVE” in giant letters too, both in 4ft and 5ft heights. 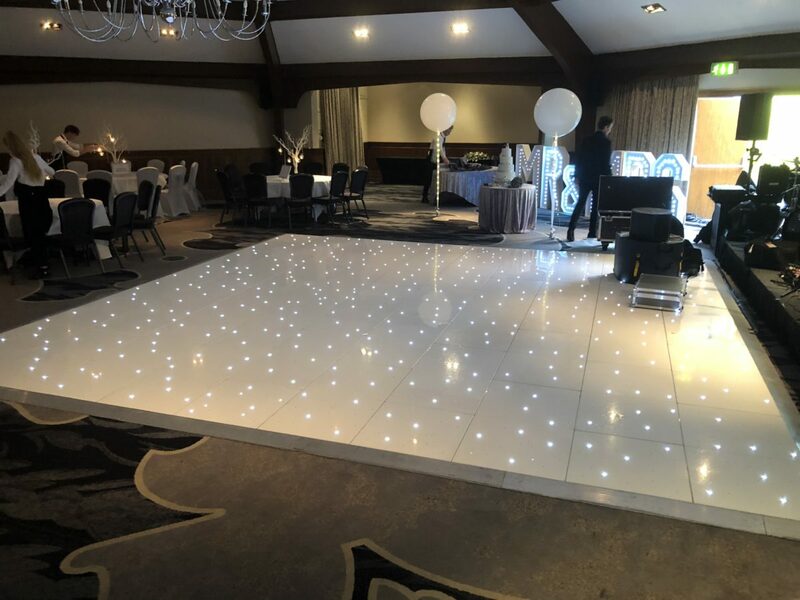 My stunning 20ft by 20ft white LED dance floor at Airth Castle. I’ve been going to this amazing wedding venue for over 20 years and I’ve provided wedding Djs and discos, white led dance floor hire, giant letter hire and much more within that period. 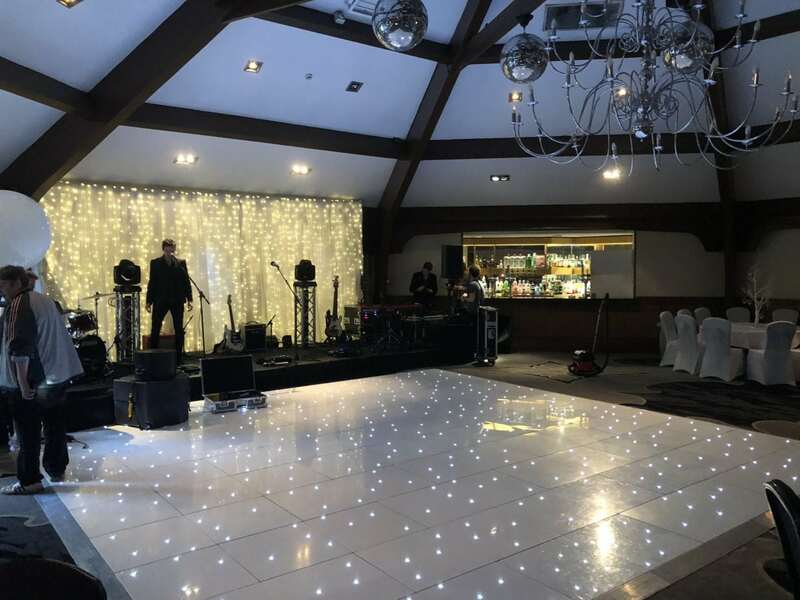 The function room has a good sized stage for your band or Dj and with its beautiful wooden beams in the roof it really is a venue full of atmosphere. The last time I was there I provided this beautiful 20ft by 20ft white LED dance floor which was hired in by the bride and groom. As you can see from the photo the white led dance floor is spotlessly clean and you can see your reflection in it. 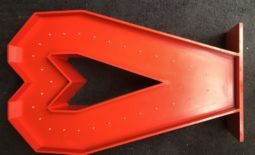 It’s the way I like my dance floors to look every time they go out. Airth Castle has lots of gardens and a commanding view down the Forth Estuary and has a myriad of places where you can take those all important wedding photographs. It is very easy to get to as it’s only a few miles from the M9 and M876 motorways and Kincardine Bridge is within eyesight of the Castle. The function room is on the ground floor and has easy access both for guests from the front and from the rear for your entertainers. This is a blessing when you’re carrying heavy equipment. As the function room is in a separate building from the castle itself there are no issues with noise keeping you up at night. So you can party all night and get a good nights rest. This venue also has a spa and conference facilities and all the usual trimmings you’d expect from a four star hotel. I think having a spa with swimming pool etc is great for the day after your big day and a great time to relax with your friends and family. 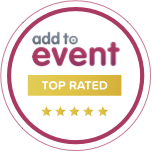 The food is excellent, the staff are friendly and attentive and I’d recommend Airth Castle as an excellent wedding venue. If you’d like me to provide you with a mobile disco, white led dance floor or giant letters for your wedding, please use the contact form and I’ll give you a price.